TORONTO | Canada shut its embassy in Tehran on Friday, severed diplomatic relations and ordered Iranian diplomats to leave [Canada], accusing the Islamic Republic of being the most significant threat to world peace. [Canada’s] Foreign Affairs Minister John Baird said that the Canadian embassy in Tehran will close immediately and Iranian diplomats in Canada have been given five days to leave. A spokesman for Iran’s foreign ministry, Ramin Mehmanparast, called Canada’s decision “hasty and extreme” and said that Iran would soon respond, the semiofficial Fars news agency reported. Baird said he was also worried about the safety of diplomats in Tehran following attacks on the British embassy there. PARIS | France’s richest man has applied for Belgian nationality amid plans by socialist president Francois Hollande for a new 75 per cent tax rate on citizens making over $1.2 million per year. 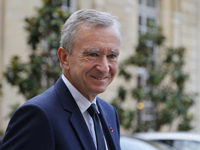 Bernard Arnault, the CEO of LVMH, a French brand group that includes Christian Dior and Louis Vuitton, confirmed on Sunday that he had applied for dual citizenship in Belgium, where taxes for the rich are not as high. Mr. Hollande, who once said he does not “like the rich,” has proposed a new higher tax rate of 75 per cent on earnings over €1million [$1.28 million], which is due to come into force later this year. The president did, however, state that the tax plan could be scrapped after around two years. “Once the economy has recovered it can be dropped,” he said. Mr. Hollande also outlined another $19 to 25 billion worth of new tax rises [Saturday] night, mainly on businesses and the wealthy, as well as austerity measures that would save the country another $12.7 billion. Mr. Arnault, who is the world’s fourth richest person with a personal wealth estimated at $40.8 billion, emigrated to the U.S. during the last socialist presidency in France in 1981, when François Mitterrand took power. He returned after the socialists switched to a more conservative economic course. However, he denied on Sunday night that his latest move was an attempt to dodge Mr. Hollande’s measures. “I am and will remain a tax resident in France and in this regard I will, like all French people, fulfil my fiscal obligations,” he said. “Our country must count on everyone to do their bit to face a deep economic crisis amid strict budgetary constraints,” he continued, adding that his bid for dual nationality was “linked to personal reasons” and began some months ago. The Indian government imposed the restrictions starting [August 20th,] after viral SMS messages contributed to a public panic in the wake of violent clashes between Muslims and predominantly-Hindu Bodo residents in the northeast state of Assam. The messages, which emerged alongside online videos and social-networking posts, warned of a Muslim retaliation and caused thousands to flee Indian cities in fear of violence. The result has been a government-enforced clampdown on text messaging—a reminder to Vodafone of the hazards of doing business in high-growth emerging markets and a nuisance to many Indian cellphone users, particularly for those who rely on texting. For Vodafone, the restrictions come about a year and a half after the mobile giant complied with Egyptian government demands to shut down mobile services in the midst of a popular uprising against the Mubarak regime. b) List at least 3 reasons Canada has given for severing diplomatic ties with Iran. b) Mr. Arnault denies his application is intended to avoid the astronomical tax bracket. What do you think? c) In your opinion, what is the highest rate any government should tax its citizens? Explain your answer. b) Why did the Indian government impose the text messaging restrictions? c) Would there have been a better way for the Indian government to handle this problem? Explain your answer. Canada’s break with Iran removes another channel for Washington to get first-hand diplomatic assessments of Iranian affairs. Canada and Britain had been main conduits of information for the U.S., which also maintains special Iranian monitoring offices in several locations including Dubai. Canada also has criticized Iran over the arrest of pioneering Canadian-Iranian blogger Hossein Derakshan, who helped develop the first Farsi language blogs and is considered one of the founders of Iran’s social media community. Derakshan was detained in 2008 and sentenced to nearly 20 years in prison two years later. Canada hasn’t had a fully accredited ambassador in Tehran since Iran ordered Canada’s ambassador, John Mundy, to leave the country in 2007 after trying unsuccessfully to come to an agreement on an exchange of ambassadors for some time. Foreign Affairs Minister Baird said the skeleton staff that was operating Canada’s embassy has already fled the country. In India on August 20, as some Vodafone users exchanged Eid holiday wishes, they were greeted with the following response: “Dear Customer! You have sent 5 SMS [text messages] today. As per instructions from the Government Regulatory, only 5 SMS can be sent per day.” By late Thursday [Aug. 23], the government had loosened the restriction to 20 text messages from five. The restrictions apply to pay-as-you-go phones, which comprise over 95% of the Indian market. The Indian government said the restrictions, which apply to an estimated 610 million prepaid cell phone users, would be in place for two weeks, until Sept. 1. The government also ordered certain Twitter accounts and Facebook pages blocked. “Vodafone is complying with the instructions from the government of India and [the Department of Telecommunications],” the mobile operator said in a statement, without elaborating much further.